The Rev. Mary Carson is a southwestern Ohio native who returned “home” in December 2016 when she was appointed as Priest-in-Charge of St. James. She was ordained deacon and priest in 1992 and has served in a variety of settings. Between 1992 and 1999, she was assistant at Trinity Church, Newport, RI; St. Christopher’s Church, Gladwyne, PA; and Grace Church, Sandusky, OH. 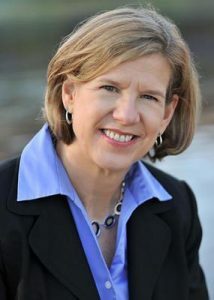 She then worked for almost 8 years on the staff of the Bishop of the Diocese of Ohio as Assistant to the Bishop for Ministry Development overseeing the ordination process and transition ministry. Having grown up as a “priest’s kid” and being on the inside of the Church for over 40 years, she decided to try something different and became Associate Executive Director and then Interim Executive Director of Lutheran Chaplaincy Service in Cleveland. A growing desire to assist church communities to grow spiritually while also connecting more with the people in their surrounding neighborhoods led her back to parish ministry in 2010 with the people of the Church of the Redeemer in Lorain where she served until her move to Cincinnati. Mary is a graduate of Kenyon College where she earned a Bachelor of Arts with an interdisciplinary major in religion and music. 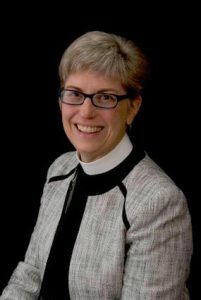 She holds both a Master of Arts in Theology with an emphasis on liturgy and a Masters of Divinity from Bexley Hall, now Bexley Seabury Seminary on whose board she proudly serves. When she’s not at St. James, you might find Mary swimming at the Gamble-Nippert Y across from St. James or at a yoga class at Four Directions Yoga Studio. Cycling and walking are other favorite forms of stress relief. Someday she hopes to become a proficient kayaker and knitter. Her love for music continues to feed her through choral singing, playing piano and very occasionally organ, and enjoying the variety of musical offerings in greater Cincinnati. Mike Smith was born while his parents lived in Westwood on Urweiler. The family moved to Western Hills and attend Mother of Mercy kindergarten and then Our Lady of Lourdes school until the family Delhi where he completed the 8th grade at Our Lady of Victory School. He attended high school for two years at Elder and in his junior year entered St. Gregory Seminary in Cincinnati. He completed his studies for priesthood in 1973 and was ordained a Roman Catholic priest on June 2, 1973. He taught for two years at LaSalle and then 5 years at Mother of Mercy High School. He served at St. John the Baptist RC Church in Harrison, St. Catharine in Westwood, and St. Bernard’s in Winton Place. Mike worked as a consultant to churches and other organizations through his own consulting practice, Pastoral Coaching and Consulting Associates, for twenty years. 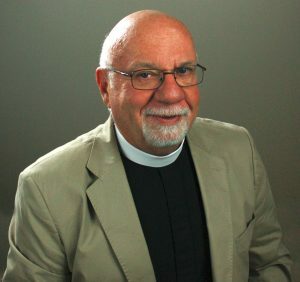 He did a major research project for the National Church and served as the process consultant for several bishop elections. He also worked with over 250 parishes to assist them in rector searches, long range planning, and conflict resolution. In 2004 Mike decided that he wanted to get back into education and began teaching at Cincinnati State where he taught ethics, psychology, and critical thinking. In 2006 he was invited to join the faculty of the newly created Christ College of Nursing and Health Sciences. There he taught psychology, ethics, and world religions. He was appoint as Dean of Arts and Sciences in 2006 and then Provost and Chief Academic Officer. He retired by the College in 2014. He received his doctorate degree in education in 2012. Mike’s Roman Catholic ordination was received into the Episcopal Church in 2013 and then was made the Priest-in-Charge through 2915. Mike is married to Mike Newman. They have been together for 38 years and legally married for 8 years. He is now very happy to be part of the St. James Community. Gayle Linkletter joined the St. James staff as administrator in January 2013. She has extensive experience in corporate communications, and previously held several positions in communications management for locally based corporations. Raised in Old Greenwich, Connecticut, Gayle joined the Peace Corps after college and served for four years on the Caribbean island of St. Lucia, where she taught French to junior secondary students. Following her Peace Corps stint, she was the editorial director at AFS Intercultural Programs in New York City, where she lived for ten years. A job change and a desire for new horizons brought her to Cincinnati, and she settled in Clifton, where she still lives today. Gayle is passionate about nurturing connections with others, and brings that passion to St. James. In her spare time, she enjoys swimming, reading and travel. The administration of any church, including St. James, often takes place behind the scenes. And that’s the way it should be. It is our desire that the church run smoothly in all areas, from Sunday morning worship service to special mailings on church activities. Whether you have an announcement you’d like to add to the weekly bulletin, wonder when the next church supper is, or need details about an upcoming church event, Gayle can answer your question or point you in the right direction.